The corrugated and paperboard box market is mature, but there are opportunities for gains, particularly in the upgrade of box features to account for more direct-to-consumer use and in emphasizing sustainability. Through 2022, demand for boxes in the US is forecast to increase 2.6% annually to $42.5 billion. Nearly half of all new demand will stem from the large food and beverage market, and 16% of new box sales will derive from the small but rapidly growing e-commerce segment. Box demand in e-commerce will post healthy growth through 2022, with the dominant corrugated box segment best positioned to take advantage of these gains despite trends toward right-sizing. Value-added set-up paperboard boxes also stand to benefit, as they are often used for subscription services and other curated deliveries. Direct to Consumer: E-tailers and logistics firms want to cut delivery times and costs. The Unboxing Experience: Boxes with high-quality graphics both inside and outside the box showcase brand image and create important first impressions about the product they contain. Greater Printing Customization: Digital printing enables on-demand printing and greater customization by making custom print runs economical. Waste is major concern, and source reduction is an effective way to meet green goals. Right-sizing the box to its contents is a key part of this trend. The development of on-demand box production also enables a wider variety of box sizes and shapes for right-sizing purposes. Foodservice and carryout will present strong opportunities for folding cartons in light of innovative food delivery options such as meal kit delivery and multi-outlet restaurant food delivery platforms (e.g., DoorDash, Grubhub, and Uber Eats). The rising trend toward general carryout and delivery will also help, as more people are choosing to eat prepared food away from restaurant dining rooms. Additionally, with mounting municipal regulations targeting single-use plastics, folding paperboard cartons are poised to gain. 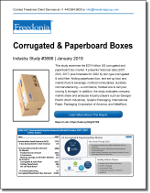 This Freedonia industry study analyzes the $37.4 billion US corrugated and paperboard box market. It presents historical data (2007, 2012, and 2017) and forecasts for 2022 by box type (corrugated & solid fiber, folding paperboard box, and set-up box) and market (food & beverage, nonfood nondurables, durables, nonmanufacturing – e-commerce, foodservice & carryout, moving & storage). The study also evaluates company market share and analyzes industry competitors including Georgia-Pacific, Graphic Packaging, International Paper, Packaging Corporation of America, and WestRock.